One of the drawbacks of Surface RT is that you can’t install applications that aren’t in the Windows App Store. I primarily use my Surface at home and work, though, where I always have access to other PCs. So, when I need access to one of those non-Windows-Store apps, I just remote into a different workstation. Using this technique, I ran into a rather frustrating issue while using Remote Desktop to connect to my laptop from my Surface at work. I usually keep the wireless adapter on my laptop enabled, which I don’t think is unusual or wrong. I also keep my laptop docked at work, meaning I have two active network connections. The problem I was running into was that my wireless connection would be lost upon connecting to my laptop using the laptop’s name (i.e., the host name resolved to the wireless adapter’s IP). This would typically result in a frozen Welcome screen, and I would be unable to reconnect. It wasn’t a connectivity, firewall, or DNS issue, because Remote Desktop would resolve and connect right away. But then I’d be stuck, unable to reconnect except through the wired adapter’s IP address, which can’t be used since it’s dynamic. I thought I fixed this previously by connecting through the wired adapter’s IP to re-enable the wireless connection, but that appears to be only a temporary solution. If I connected using the wired adapter’s IP address, I would have no problem. If I connected using the wired adapter’s IP address, I would also see the wireless connection go away. While connected through the wired adapter, I could reconnect the wireless connection, disconnect from the wired connection, reconnect through the wireless adapter, and everything would work. Today, I think I found a good long-term solution. The secret for me was to save the credentials for the wireless connection. 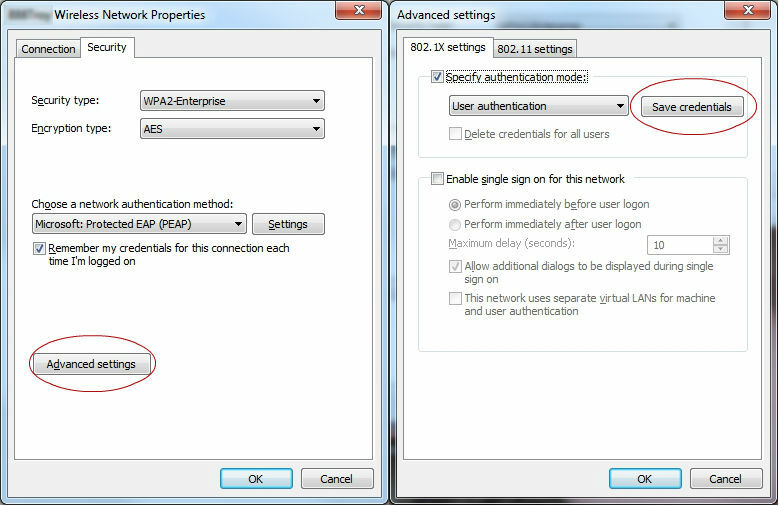 To do this, click the wireless connection from the Network and Sharing Center. When the properties window appears, click Advanced Settings on the Security tab. Then click Save Credentials in the advanced settings window. Once I did that and saved my credentials, I no longer had issues connecting to Remote Desktop through the wireless adapter. Hooray!